When the angel told Mary of God's plan to bring the Messiah into this world through a virgin birth, the news of it troubled her greatly. Mary knew the impossibility as well as the grave consequences she would have to face, carrying a child out of wedlock. But after the angel assured her that with God, nothing is ever impossible and no word from God shall be without power or impossible of fulfilment, she believed. 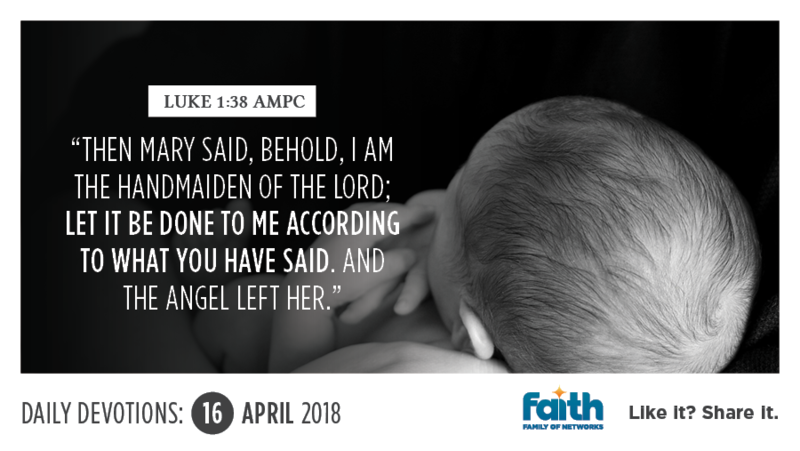 Mary responded to the angel the only appropriate way we can respond to God's grace. She wholeheartedly agreed with His Word. She fully surrendered herself to God's plan to use her as His vessel, and trusted Him to be with her, every step of the way, taking full responsibility for her, just as the angel said He would. Agreeing whole heartedly with God's Word, in spite of the impossibilities, is all that's required of us. As we agree with His Word, it goes to work in our lives. Everything that God promised Mary came to pass, just as He said it would. Today, decide to take God at His Word. Declare out loud: "I wholeheartedly agree with everything God has said about me in His Word. I wholeheartedly agree with His Word that says I'm healed. I wholeheartedly agree with His Word that says I'm blessed. I wholeheartedly agree with His Word that says I'm redeemed, and that nothing is impossible because I believe!"